Welcome to Grow Your Blog 2015 and Giveaway! I am happy to be joining this for the first time. This is where many bloggers get together to make new friends and grow their blogs. Thank you Vicky from 2 Bags Full for organizing and hosting this event. Let me share a little bit about what I blog about at Julie's Lifestyle! I created my blog in November of 2012 and I have enjoyed blogging and meeting new friends from all over the world. I love to blog about cooking for my family and sharing my recipes. 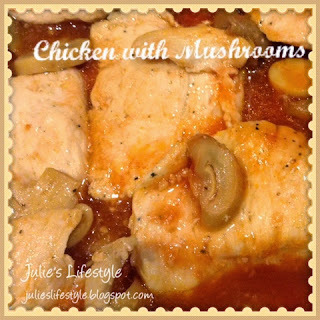 I enjoy cooking this Chicken With Mushrooms dish for my family and it's a favorite. To see how to make this recipe click here. I enjoy crocheting and sharing my creations that I make. I self taught myself how to crochet after a lady from my crochet group at my church taught me two crochet stitches years ago. 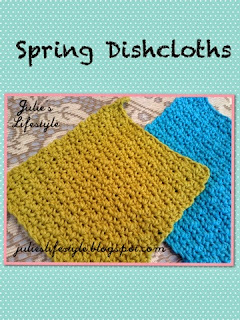 Crocheting dishcloths are one of my favorite projects to make and to see this blog post you can click here. My Mom and Aunt taught me how to knit in the summer of 2009. After that I took two knitting classes at the Lion Brand Yarn Studio. 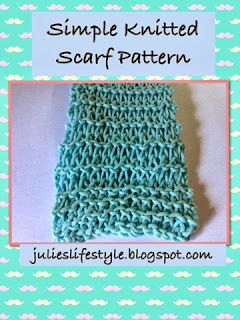 Here is a knitted scarf I made and to see that post you can click here. In January 2014, I started sharing my love of makeup on my blog. I posted anything to do with beauty. 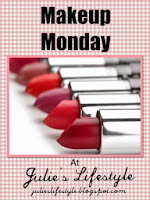 To see my Makeup Monday posts you can click here. 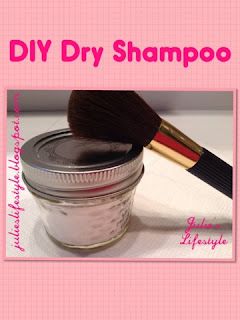 One of my favorite posts is DIY Dry Shampoo and to see that post click here. So that is a little bit about me and what I love to blog about. I hope I have inspired you to join my blog because it has a little bit of everything. Please take a minute and enter my GIVEAWAY! 1) To win the prizes of my giveaway, please leave a comment and you will be entered! 2) You don't have to be a follower but I would love to have you follow my blog Julie's Lifestyle via Google Friend Connect or Bloglovin. Just let me know how you joined in the comment area. 4) To join me please look at my sidebar. Please make sure that I can contact you via your blog or by email. If you don't have a blog then please write your email address in your comment. THE WINNER WILL BE ANNOUNCED ON FEBRUARY 15th! I will post the winner's name on that day! Here is what the lucky winner will receive! Two books that I love. 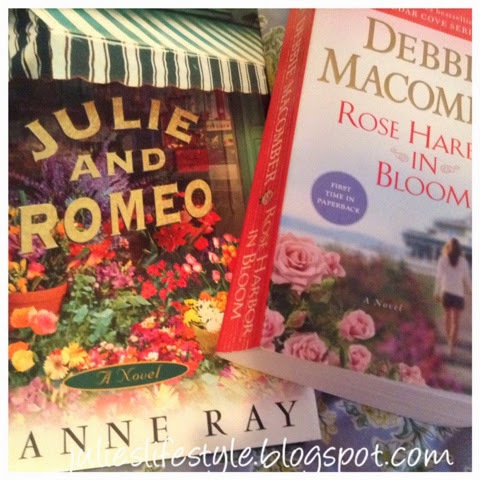 Julie and Romeo by Jeanne Ray and Rose Harbor in Bloom by Debbie Macomber. A crocheted Cowl and Hand Warmer Set that I made. A bookmark and my favorite hand cream by L'Occitane. Thanks so much for visiting my blog and I hope you will become a follower! 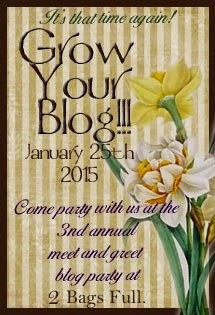 I look forward to visiting you and getting to know new people during this years Grow Your Blog Party 2015! Good evening, friend! We started our blogs around the same time - we are only 4 months a part; how fun is that! :) You are a blessing and I am so glad we met through blogging! I love your posts and the things you share. Hugs to you, dear Julie! Lovely post Julie! I always enjoy what you share with us! And, such a sweet giveaway. Have a blessed and beautiful Sunday my friend! I started in 2012 also (April) and I think we met through a blog hop I was doing? It's been great getting to know you and learn about your life and interests Julie. Here's to many more years of blogging for both of us :). What a lovely post for Grow Your Blog party - I always love your posts and I've learnt a lot about makeup from you - thank you!! I'm already a follower of your blog - it's lovely to meet up at the party too! I'm visiting on behalf of Vicki to welcome you to your first GYB party and to thank you for joining in! Enjoy the party and have fun meeting new bloggers! Please enter me in your lovely giveaway - I'm always looking for a new book and L'Occitane is a favourite of mine too. I'm keeping my fingers crossed that you can help me to get started on learning to crochet! I have recently started following you and enjoy every visit to your blog. I started blogging in April,2012 so we were both newbies together! You do great work with your crochet. I'm not part of the hop, Julie, but I have to say that I love your blog. I think it was one of the first that I stumbled upon when I started blogging in 2013 and I have enjoyed following your posts and getting to know you! You are the one who motivated me to start crocheting...slow and steady! ;) I love the diversity of subjects you cover and your photos!! I hope you have a great week! Happily I'm already a follower, but I'm stopping by as part of Grow Your Blog. What a fun blog party. Your giveaway looks fabulous. Hello from Pennsylvania. I am having so much fun visiting everyones blogs on Vicki's GYB Party. So sweet of you to offer a giveaway. Hi, Julie! I'm stopping in from GYB hop. Even though I've been following you awhile now, it was good to read more about you. Thanks for the visit and kind words!!! Waving hello from France in the blogging party. Your giveaway is amazingly generous, I'd love to enter. 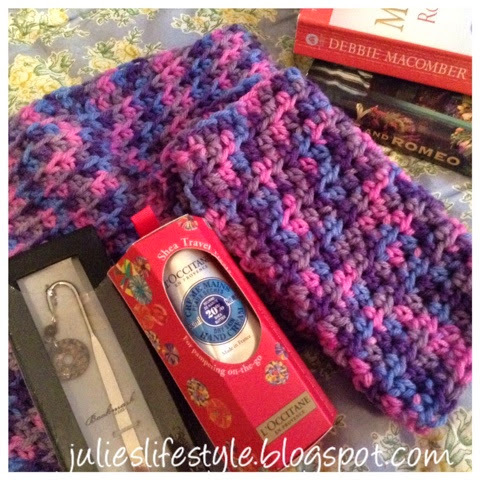 Hi Juile - so nice to meet you and get to visit your lovely blog and read about you and your interests. I will be following you and looking forward to your lifestyle posts - the chicken dish sounds yummy. Your give away is beautiful. Great idea! I hope a lot of people find your wonderful blog. I always enjoy your posts. Thanks for hosting such a great giveaway. Hi Julie, nice to meet you and have a look around your lovely blog, thanks for stopping by my blog too. Hey Julie! I participated in Grow your blog last year I believe. It helped a little bit. Hope you get many visits and many new followers! Your giveaway is wonderful! Someone will be very happy to receive all those goodies. Have fun and good luck! You have a very nice blog ! You post about interesting things, I would love to learn more about crocheting :). Thank you for visiting my blog and for signing up. Also for your very kind words. I'm a follower now. Have a great GYB party ! Julie, thank you for sharing with your Grow your Blog! I love to work with fiber arts too! And such a lovely giveaway. Please do enter my name in! I am already a follower. And speaking of giveaways - you are the winner of my giveaway! Please stop by! Hi!! You have such a lovely blog! I hope you're enjoying the blog hop as much as I am! Thank you so much for sharing your wonderful talents.. My daughter crochets but I gave up! I love to see what people have made so I will enjoy reading your posts and hearing about your newest project! Thank you so much for your kind comment and for following along. 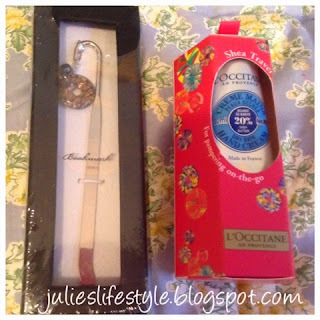 It's so nice to meet you..
Nice to visit your blog, and what a sweet and generous giveaway! I need to come back often for makeup tips...my makeup 'advisor' went away to college, and now I'm on my own and clueless! Thank you for taking the time to visit my blog! Your blog is so pretty! We do share a love for crocheting and knitting, but cooking is not my thing. I choose knitting over cooking any day. However, with a large family like mine cooking is not an option. So I may just have to try some of your recipes. I love your patterns too. I look forward to reading more of your posts. Good on you for learning how to crochet and knit - there are so many wonderful tutorials online. I think we are lucky to live in this age. I am really enjoying finding more lovely blogs to folow - your chicken recipe looks yummy. It was so nice to have you visit Normandy on your hop around the GYB party yesterday glad you enjoyed the tour. My Nana tried to teach me how to crochet when I was a young girl but I never did get the hang of it! I loved learning more about you, Julie. I love to crochet dishcloths, too. It's such a quick, easy project that helps pass the time. What a fabulous giveaway! You're so talented. Thanks for visiting my blog. I am impressed you taught yourself crochet. I have crocheted and have knitted but it never amounted to much and now I wouldn't know where to begin. Lovely to meet you and thank you for the chicken recipe - I shall be trying it! Always love your posts. That is one generous give away... Hugs!! Hi Julie, crochet is something I would like how to do, wish my mom lived closer so she could teach me. I'm off to check out the rest of you blog, Thank you for you visit over in my neck of the woods! Hi Julie, thanks for coming by my blog! Although I am not much into make up I love crafts and travelling and I'd love to get to know you better through your blog. I loooove reading and when I saw the books on your giveaway I thought how great that is to have someone giveaway books. And not only that! I joined your blog followers through bloglovin. AriadnefromGreece! Hi Julie am visiting from the blog party. What a sweet give away. I am a happy neaw follower. Hi Julie, Wow, what a nice giveaway! Love your creations. 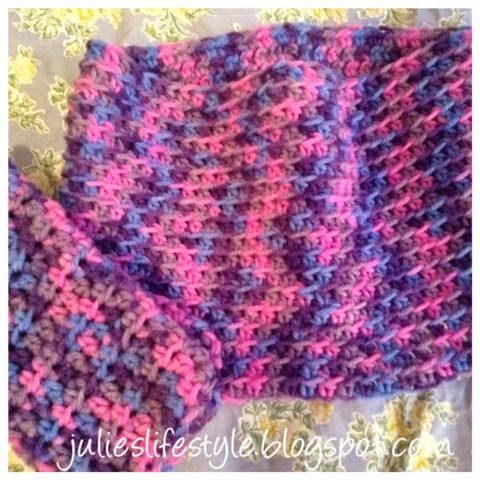 I crochet dish cloths too and I pinned your pattern to try it out. I also want to try the chicken mushroom dish. I'm your newest follower! Look forward to getting to know you better! Hi, Julie! Nice to meet you. I'm here via the GYB party. What a wonderful blog - so interesting and chock-full of all sorts of interesting and creative ideas. I'm a follower through Goigle Friends. Best wishes for a smashing GYB. I look forward to following you! Such a pretty blog! Thank you for visiting mine. I am a new follower. I love those dishcloths too. My MIL used to make them for me. Great for scrubbing. Hi Julie! I'm visiting via GYB and have enjoyed reading several of your posts. The books in your giveaway look like good ones, thanks for the opportunity! So nice to meet you. I have enjoyed my visit to your lovely blog and looking forward to getting to know you out here in this amazing world of blogging. Your giveaway is awesome. Thank you for letting me enter. I've enjoyed a look around your blog. Isn't it great to have hobbies we enjoy, and share them with the blogging world? Such fun! Enjoy GYB! Hi Julie, I enjoyed reading your blog! You have so many interesting things you blog about! Enjoy the blog party! 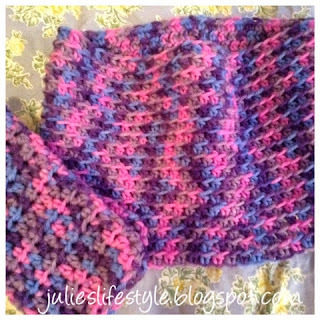 I love the cowl and hand warmer, the colors are gorgeous! Hi Julie, So nice to meet you via the GYB party. You have a lovely blog. I'm a new follower. 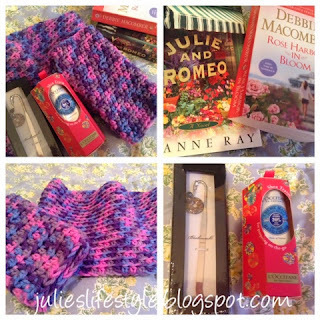 This is an awesome giveaway Julie! I have to try your chickens and mushroom dish. I never thought of that. I follow you via Bloglovin! Fabulous prizes. I'm still hopping around the Grow Your Blog party and I just found your lovely blog! I'm a new follower! I taught myself to crochet too. Many years ago my aunt was visiting and she was making one of those go-on-forever gigantic single granny square afghans and I decided I had to have one. She showed me a couple of stitches (probably ch and sc) and I went on from there. Now my passion is crazy quilting. Nice to meet you - Enjoy the tour! Hi Julie - a lovely post. My cousin taught me to crochet when I was 12 years old - it is a craft I keep going back to! Hi, ive hopped over from gyb party. Ive recently learnt to crochet, ive found that experienting and just making it up as you go along teaches you a lot about what you can do with crochet. Hi Julie, visiting from the GYB hop. Lovely projects! Thanks for being a part of the hop. Going to go look at your recipes, I love to cook! You are so sweet! What a fun giveaway...the best part being your homemade pretties! Have a Happy Valentine's Day! What a nice giveaway! I'm very pleased to partecipate, thanks. I follow you on pinterest and bloglovin. Great giveaway! I follow you on Bloglovin! Hi Julie, pleased to find your interesting blog via the GYB party. Will be back again. Okay not sure what happened but I think I lost my last comment. Your chicken and mushrooms sounds delicious. I became a follower and what a FUN giveaway. Thanks for the chance to win. Great blog! It's my first time here... nice to "meet" you and so many other amazing crafters. God bless! Last minute -- I've been longing for a hand warmer, what a blessing that would be! Plus all the other wonderful things on this giveaway, thank you, and Happy Valentine's!